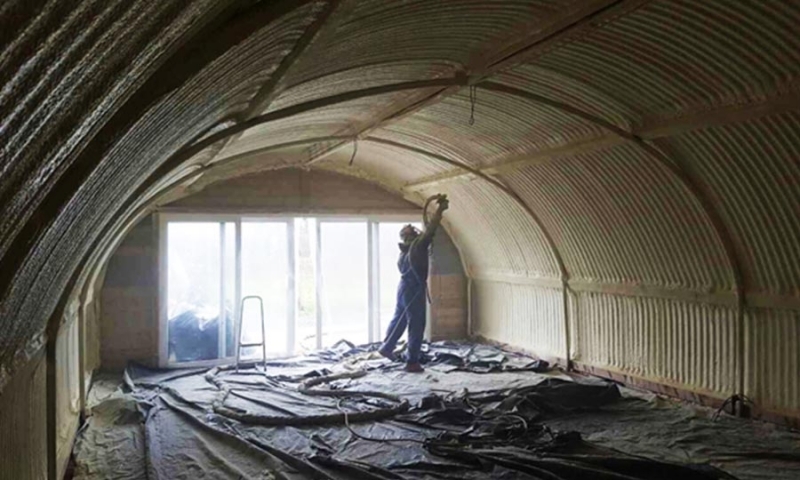 Commercial spray foam is usually applied in the form of closed cell spray foam for industrial buildings, roofs and exterior insulation, giving a perfect seal against any problems such like draughts, moisture and rotting. Closed-cell spray foam insulation is an efficient insulating material. PCC™ 2000 foam acts as a vapour barrier, insulation, and air barrier all in one. PCC™2000 foam adheres directly to the substrate that will form a seamless and permanent cover over and around even the most difficult shapes. However, it only expands to 50 times its liquid volume it seals cracks and joints, and around protrusions such as brick ties, to form a continuous insulating air barrier that remains for the life of the building. PCC™2000 has one the highest R-values per inch of any insulating material. This helps reduce energy costs while improving building comfort as well as indoor quality and comfort. The continuous air-tight seal means that dust and other exterior pollutants can’t enter the building. PCC ™2000 is also a green product with a unique formula that contains no ozone-depleting chemicals such as CFCs, HCFCs, or fibers ( formaldehyde and asbestos). No toxins are emitted after installation. The substance never decomposes or deteriorates, which means there are no concerns about harmful fibers or gases escaping into the air in the future. PCC™2000 foam also adds structural strength, and increases shear and racking strength by 300% to a building. Closed Cell Foam is a strong and rigid spray insulation solution containing small pockets of gas that makes it very difficult for hot air or cold air to pass through it. It has a higher insulating value than open cell foam and creates a resistant barrier against water vapour and the elements. Closed-cell polyurethane spray foam is one of the most efficient insulating materials commercially available. Closed-cell foam incorporates an insulating gas that is retained within the cells referred to as the blowing agent, which leads to the highly efficient insulating properties of the material. Also, as this foam is closed-cell, it provides a highly effective air barrier, low moisture vapour permeability, and excellent resistance to water. The most common foam density for closed-cell polyurethane foam is approximately 41 kg/m. Closed-cell polyurethane foams are usually characterized by their rigidity and strength, in addition to the high R-Value. Also, studies show that wall racking strength can by doubled or tripled when closed cell foam is applied. Due to the cell structure of closed cell foam; they have a low vapor permeance and may be considered a vapor retarder depending on the thickness and is used in exterior spray foam insulation applications.